Every now and then I like to go back to an old artwork that i think could use a little more love and give it a facelift. It’s sort of a cheat, in that I get to work on something and keep from getting rusty while at the same time not having to go through the exhausting process of coming up with a new concept. 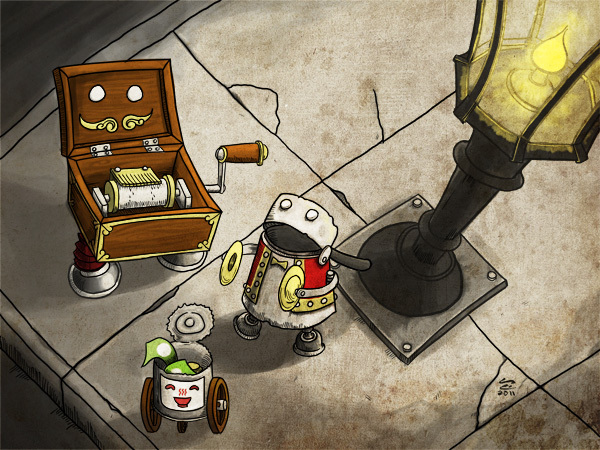 The original artwork for the hugbots was made more than a year ago for a gameartisans mini-competition. I really liked the concept and thought that if I blew it up it’d make for a nice print. While it was fun going back and updating it I did reach a certain point where I felt I would be better off just creating something brand new, so this is about where I stopped. 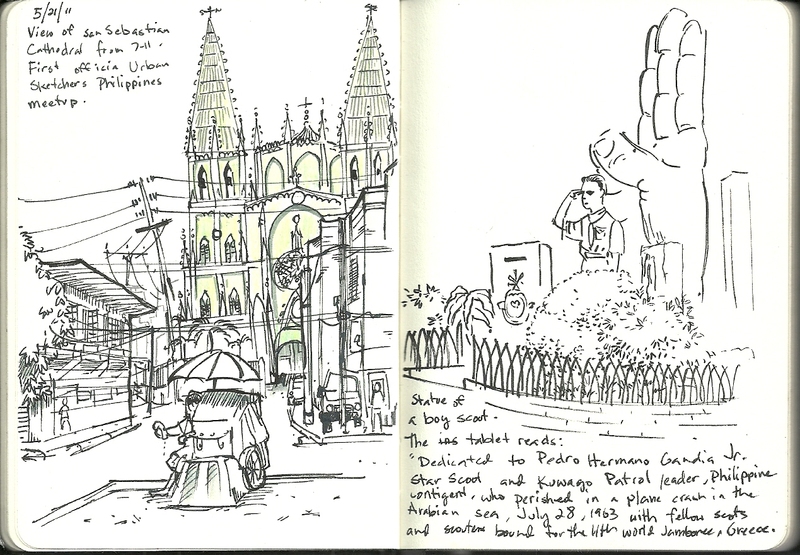 Went on a sketchwalk with the Urban Sketchers Philippine group last Saturday, which was a lot of fun. I haven’t been to the San Sebastian Basilica in decades, so it was nice to explore that area. The gothic extravagance of the cathedral was pretty daunting when I tried to sketch it from up close, so I moved outside of the cathedral to the 7-11 across the street to get this particular view. The sketch on the left is of one of the 11 boy scouts that died in a tragic plane crash while on their way to a Boy Scout Jamboree in 1963. Sadly, it wasn’t the boy scout that drew my attention, but the giant hand behind him. Aissa was shopping for some home decoration stuff in SM Makati last Sunday so I went to National bookstore to pick up a paintbrush for this Saturday’s sketch session of the San Sebastian Cathedral. I had to kill some time after that so I wandered over to the small circular park in the middle of the Glorietta shopping complex. At first I sketched the Glorietta 5 shopping complex. 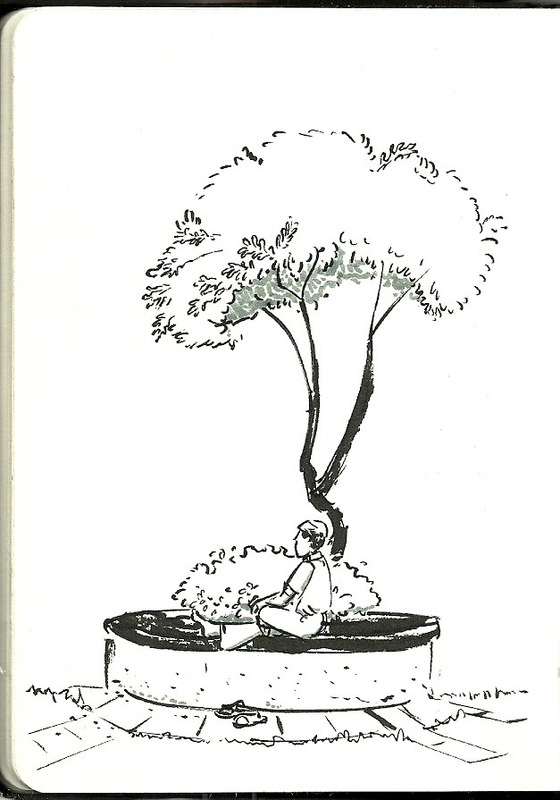 I wasn’t super pleased with that so I’m posting this sketch of a man under a tree (in the same park) instead, which I thought turned out rather nicely. Travelling to the Great Wall was certainly one of the “must dos” of our trip to Beijing. There’s a lot of debate on which part of the great wall you should visit in terms of “authenticity” but since we were travelling with a group that included my 16 year old sister in law and my 59 year old mother in law, I chose ease of access as the primary criterion. Badaling is said to be the most tourist trappy of all the sections of the great wall, but it was the most well restored and easily accessible by train, so it won out handily. 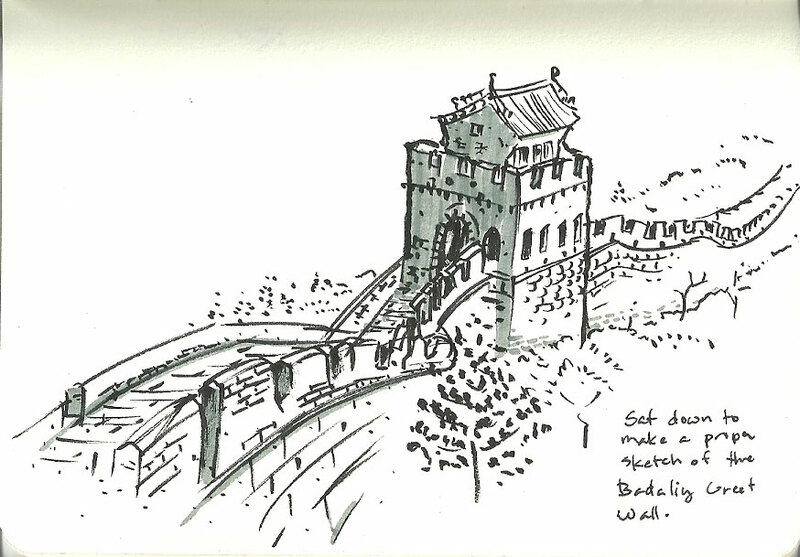 The sketch above was after a 500m hike from the Badaling train station to the small commercial area outside the great wall. The girls had taken a bathroom break so I had 5-10 minutes to sketch by the side of the road. I was actually a little disappointed because I’d heard that there would be merchants here with camels that you could have a photo op with, and sunbears that you could feed carrots to, and I’d wanted to sketch them. I won’t venture an opinion on the tackiness of such obvious tourist related commercial enterprises, but certainly it’s not something I get a chance to see/draw everyday. 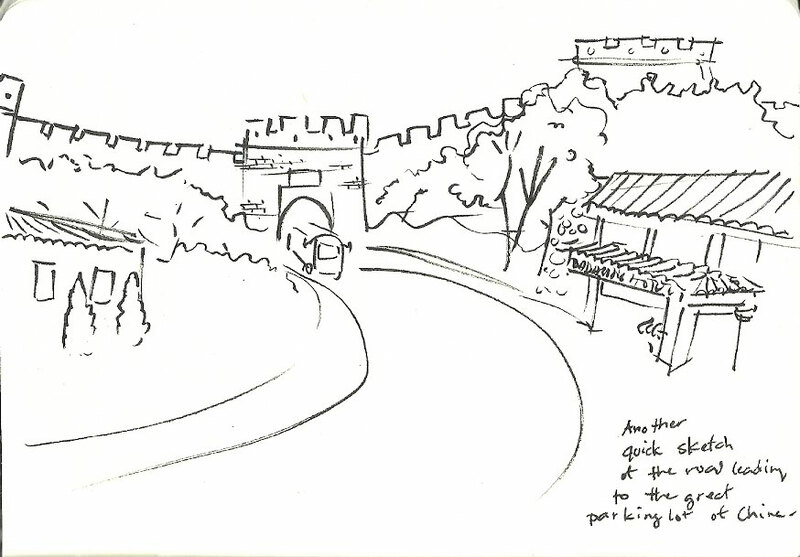 This was sketched at the highest section of the Badaling Wall, at least of the area that we visited. There is a path leading left and a path leading right when one enters the great wall, and supposedly the path to the left is steeper but has better views. I coaxed my family to take the leftmost path mostly because all of the tour groups were going right, which meant a huge mass of people on the wall. Since this was the highest section of “our” wall, I decided to take a break to commemorate the climb (and get a little rest as well), spending about 30 minutes on this particular sketch. 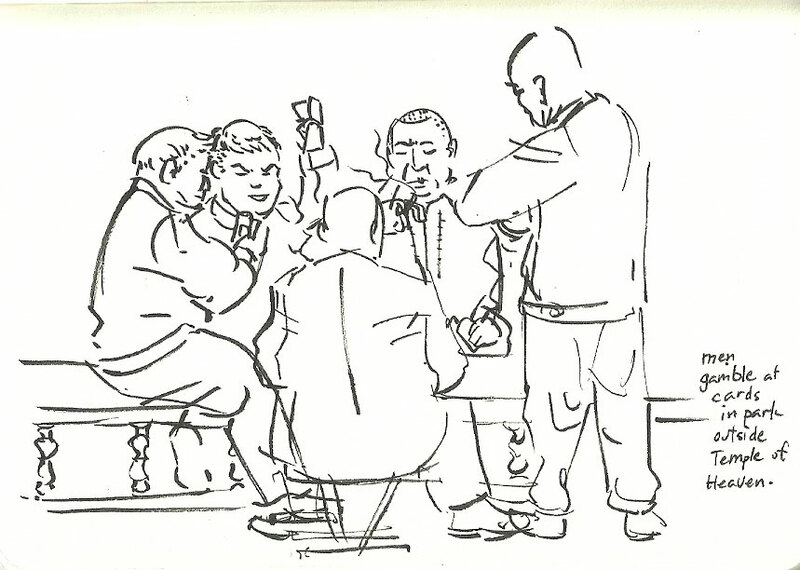 There were a number of people looking of my shoulder while I was sketching, but since they didn’t really ask questions I was able to sketch without any interruptions. I’d love to visit Beijing again someday, ideally when the Chinese government is less paranoid about handing out visas. There are still many places to see in the city proper, and definitely quite a few places where I wish I had more time to sketch. Day 2 of our Beijing trip was spent wandering around the park area of the Temple of Heaven and going into the temple complex itself. It’s a huge complex, and we only saw about a quarter of it. 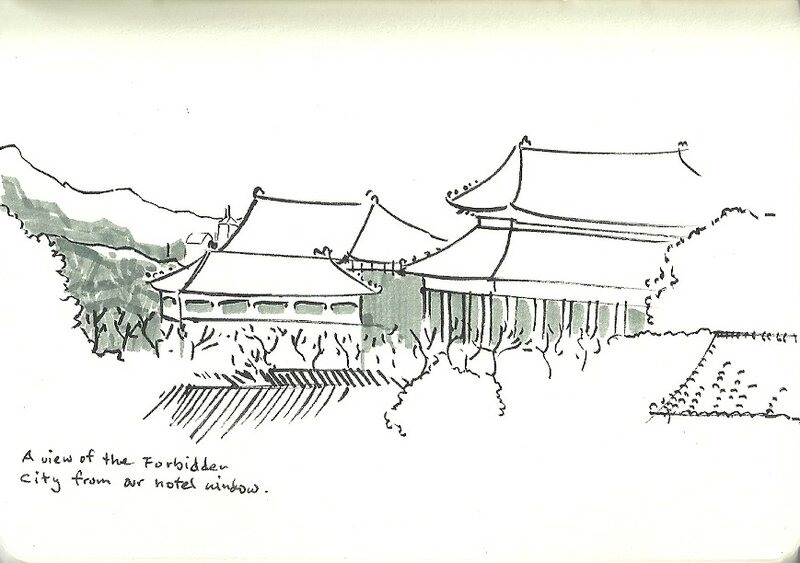 The scene above was sketched while we were taking shelter from the rain in one of the walkways leading up to the temple. This sketch was drawn in another walkway that surrounded a Cherry blossom garden. 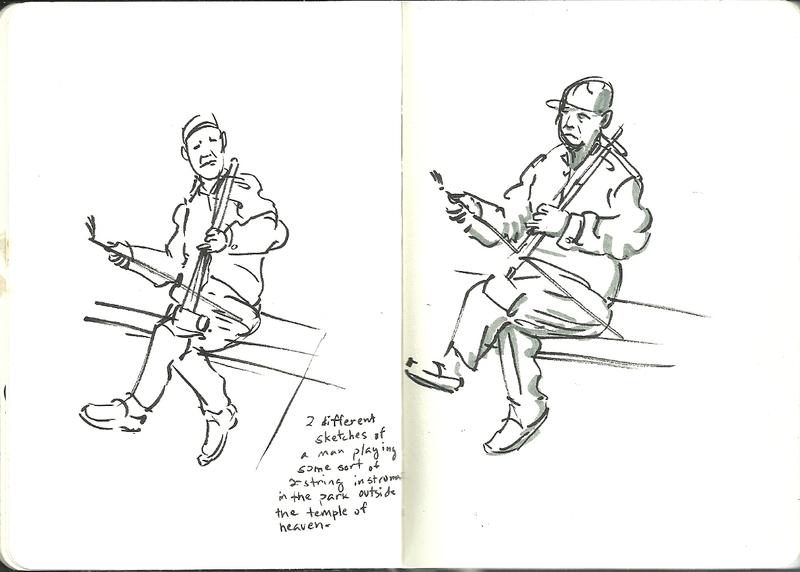 An old Chinese man as playing some beautiful music on what I now know is an Erhu. I wanted to give him one of the sketches but I was a little too shy (and also not satisfied with how the sketch looked) to do so. After the temple of Heaven we went to the National History Museum just outside the Temple of heaven’s West Gate to check out some dinosaur fossils. Shame I didnt’ think to sketch there, I guess I was just overawed at the size of the fossils that they had. In any case my last sketch of the day was at a cafe we found while looking for the nearest subway station to go back to our hotel. It was Sunday, and we were going to have mass at the Wangfujing Cathedral in Beijing. I had been informed by the Philippine Embassy that there was an English mass at 4PM, but seeing as my mother in law was very serious about making sure there was a scheduled mass today I walked my way to the cathedral at 9AM in the morning. After looking in vain for any signage that announce a special Easter Mass, I tentatively walked over to a Chinese nun who confirmed that there indeed was a 4PM English mass that day. Feeling more relaxed now if there wasn’t a mass at 4pm, it’s on her head, not mine), I took a seat at the little park area in front of the church and noticed a couple of old ladies cutting other old ladies’ hair. I have no explanation for this cute cultural practice, but I knew that I had to sketch these endearing little old ladies. After hearing mass (which was preceded by a series of events which included a taxi driver miming shooting an AK 47 to indicate confirm that we wanted to go to the military museum) we decided to relax in the afternoon and rest up for our great wall trip the next day. 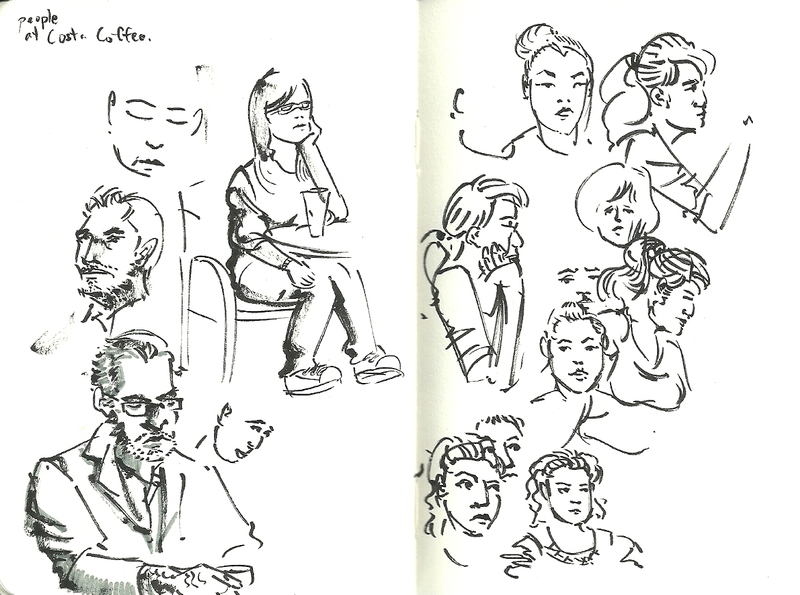 We sat ourselves at Cafe Costa (which sold mango lattes) and while the girls chatted in the background my brother-in-law Luigi and I took the opportunity to sit down and sketch some of the cafe patrons. 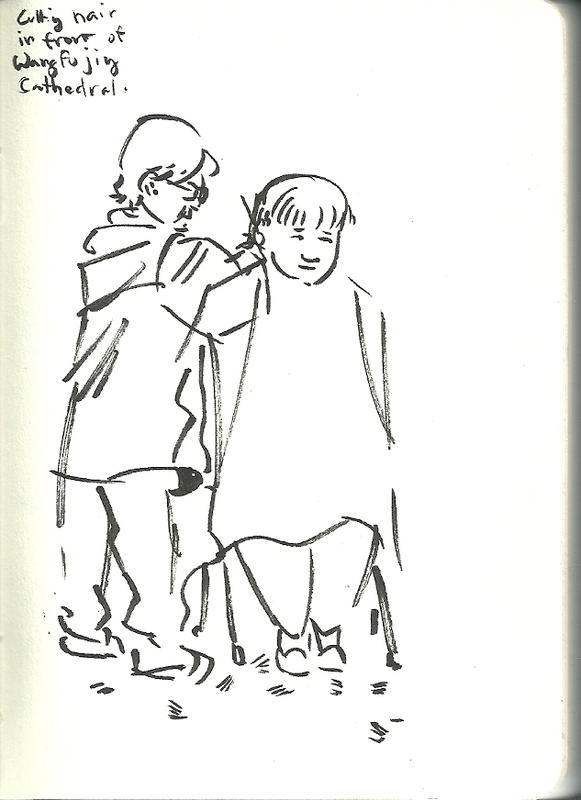 This sketch was a bit of a cheat, since I drew it from our bedroom window on the day that we left. To be honest I didn’t get a lot of time to sketch on this trip because Aissa and I had to herd her family around the whole time. Not that it wasn’t fun, mind you. It’s just hard to ask 4 people to sit still while you sketch something. 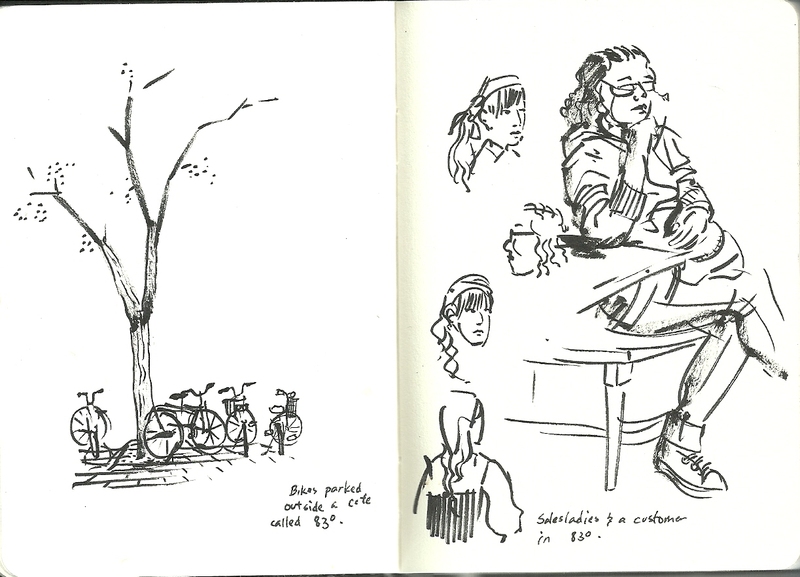 Most of the sketching I did on this trip was when I would wake up early and go off on my own to have a coffee or scout ahead for our destinations for the day. Nevertheless this is a view of the Forbidden City, which was the first place we visited in Beijing since it was just a 10 minute walk away from the hotel we stayed at. I can’t tell for sure, but I believe that the cluster of tall buildings I drew on the right are the Hall of Central Harmony and the Hall of Preserving Harmony, and the other tall structure might be the gate to the inner court. In the foreground are some trees and the rooftops of some traditional Chinese houses that are built along the “hutongs” or alleys of the old city. In the distance is one of the mountain ranges that surround Beijing and some of the modern skyscrapers that now dominate the Beijing skyline. My time in the Forbidden City may have been colored by the fact that there were a horde of tourists, and that we were caught in a late afternoon torrent that had us running for the nearest cafe where we could take shelter and warm up. It’s a far cry from our time in Japan, where even the most popular sites we went to were never overpoweringly crowded, and the people were reserved even when they were there. In contrast, the numerous tour guides shouting into their megaphones at their tour groups unfortunately did detract from the majesty of place. It’s hard to appreciate how important “Harmony” was to the ancient Chinese when their 1.3 billion descendants are yelling at each other, often while they’re right next to you. Tiananmen square was equally crowded, though since it was an open area we all felt less cramped. It’s there that you get to appreciate Modern China’s sense of grandeur and need to impress upon their visitors that they’re a mighty nation. The giant obelisk certainly makes you feel small, and the mighty sculptures of Chinese people (The largest and most steroid infused version of Chinese people I’ve ever seen) flanking Mao’s Mausoleum are a visual treat. A short walk away from the Square is the National Center for performing arts, which is a must see for anyone interested in modern architecture, or things that look like UFOs. The entire family was properly awestruck by this building, and we all wished that some Filipino Taipan would build something so ludicrously expensive and impractical yet impressive structure.